And in The End, there are guitars! Paul McCartney promised to "rock the roof off" at the start of last Friday night's Coachella set - not that there was a roof at the desert fest - and did so with a two and-a-half hour set that was as as emotional as it was jubilant. The night of Macca's performance fell on the 11th anniversary of the death of his wife, Linda. "But she loved the desert, she loved music," said McCartney, whose setlist was chock full of Beatles songs, as well as hits from his 'other' band Wings, and new material from his electronica-tinged alter-ego Fireman project. But it was the generous helping of Beatles smashes that had the crowd in the palms of McCartney's hands, and it seemed as if every song held some sort of special meaning. 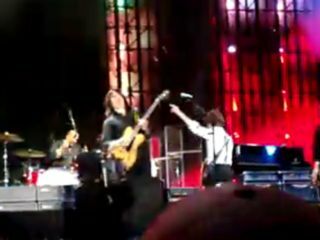 There were shout-outs to late ex-Beatles John Lennon and George Harrison (Macca played Something on a ukulele George had given to him; in addition, he performed a rousing version of Lennon's Give Peace A Chance). McCartney's four-piece band tackled the broad range of music with seamless aplomb and gained steam as the night built to a how-great-can-this-get? conclusion of Sgt Pepper's Lonely Hearts Club Band (reprise) that segued into The End, with guitarists Rusty Anderson and Brian Ray playing George and John to Paul's, er, Paul, in a thrilling, extended axe jam. And guess what? You can see it below!